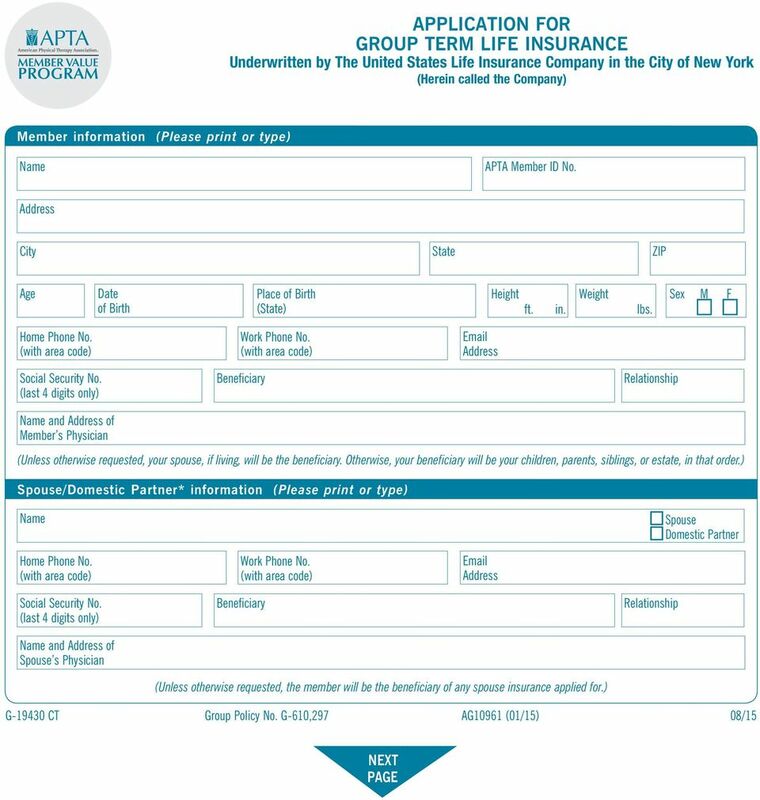 Download "APPLICATION FOR GROUP TERM LIFE INSURANCE Underwritten by The United States Life Insurance Company in the City of New York (Herein called the Company)"
3 Please answer these brief questions 1. To the best of the member s/spouse s belief, has the member/spouse ever had, been diagnosed with, or been treated Member Spouse for: chest pain; disease or disorder of the heart, liver, kidneys, blood or lungs; high blood pressure; stroke or other neurological disorder; mental/nervous disorder; drug or alcohol abuse; diabetes; cancer or tumor; Acquired Immune Deficiency Syndrome (AIDS), AIDS Related Complex (ARC) or AIDS related condition? Has the member/spouse, during the past 5 years, consulted any physician or other practitioner or been confined or treated in any hospital or similar institution, for any reason other than those stated above? Has the member/spouse used tobacco or nicotine in any form during the past 12 months? Is the member/spouse now taking prescription medication or receiving medical attention? For Yes answers to questions 1-4 above, please provide details in the space provided below. If more space is needed, use a separate sheet of paper, signed and dated. If additional information is attached, check Yes. Question No. 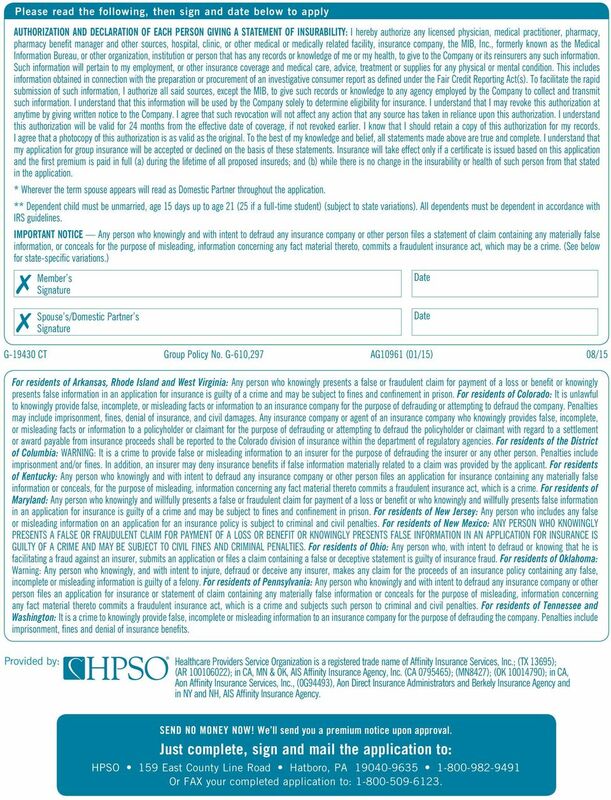 Member Spouse Condition Occurred Duration Degree of Recovery Name and of Physicians, Hospitals or Clinics Consulted Existing and pending insurance section Life Insurance in Force and/or Pending on Proposed Insured s Life, including Business Insurance: (If none, check None. ) Member Spouse Name of Company Type of Coverage Life Amount Year Issued None Do you plan to replace this coverage? 5 (These Notices must be retained by the applicant) MIB DISCLOSURE TICE Information regarding your insurability will be treated as confidential. The United States Life Insurance Company in the City of New York or its reinsurers may, however, make a brief report thereon to the MIB, Inc., formerly known as Medical Information Bureau, a not-for-profit membership organization of insurance companies, which operates an information exchange on behalf of its members. 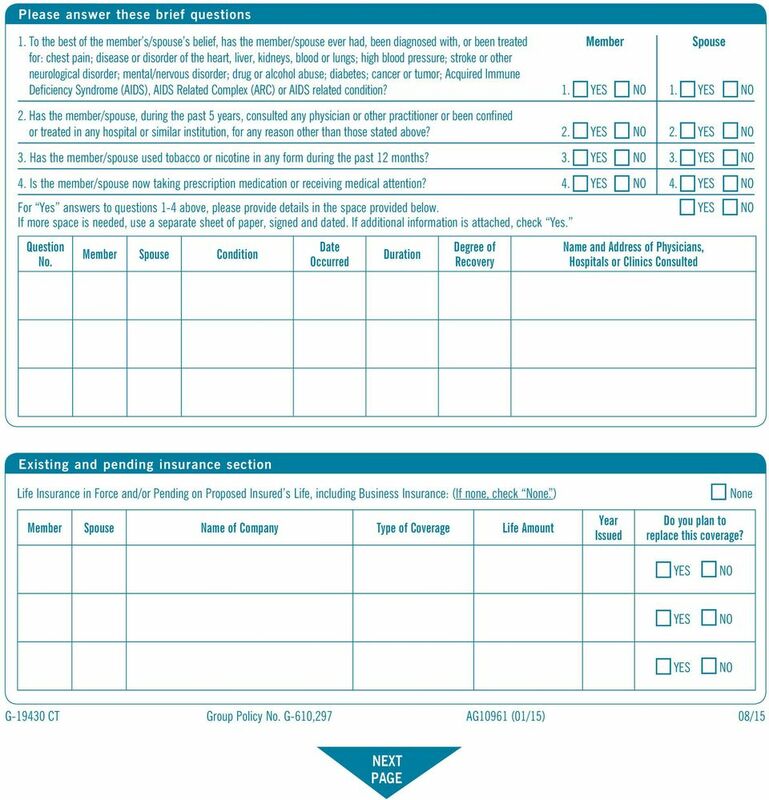 If you apply to another MIB member company for life or health insurance coverage, or a claim for benefits is submitted to such a company, MIB, upon request, will supply such company with the information about you in its file. Upon receipt of a request from you, MIB will arrange disclosure of any information in your file. Please contact MIB at If you question the accuracy of the information in MIB s file, you may contact MIB and seek a correction in accordance with the procedures set forth in the Federal Fair Credit Reporting Act. The address of MIB s information office is 50 Braintree Hill Park, Suite 400, Braintree, Massachusetts The United States Life Insurance Company in the City of New York, or its reinsurers, may also release information from its file to other insurance companies to whom you may apply for life or health insurance, or to whom a claim for benefits may be submitted. Information for consumers about MIB may be obtained on its website at Note: Canadian Members should continue to use the following address: 330 University Avenue, Suite 501, Toronto, Ontario, Canada, M5G 1R7, tel. no TICE AS REQUIRED UNDER THE FAIR CREDIT REPORTING ACT(s) This is to inform you that as part of our procedure for processing your insurance application, an investigative consumer report may be requested for the preparation of a report whereby information is obtained through personal interviews with your neighbors, friends or others with whom you are acquainted or who may have knowledge of any such items of information. This inquiry includes information as to your character, general reputation, personal characteristics, and mode of living. You have the right to make a written request to be informed as to whether or not such a consumer report was requested, and if such report was requested, the name and address of the consumer reporting agency to whom the request was made. You may receive a copy of this report by contacting such agency. 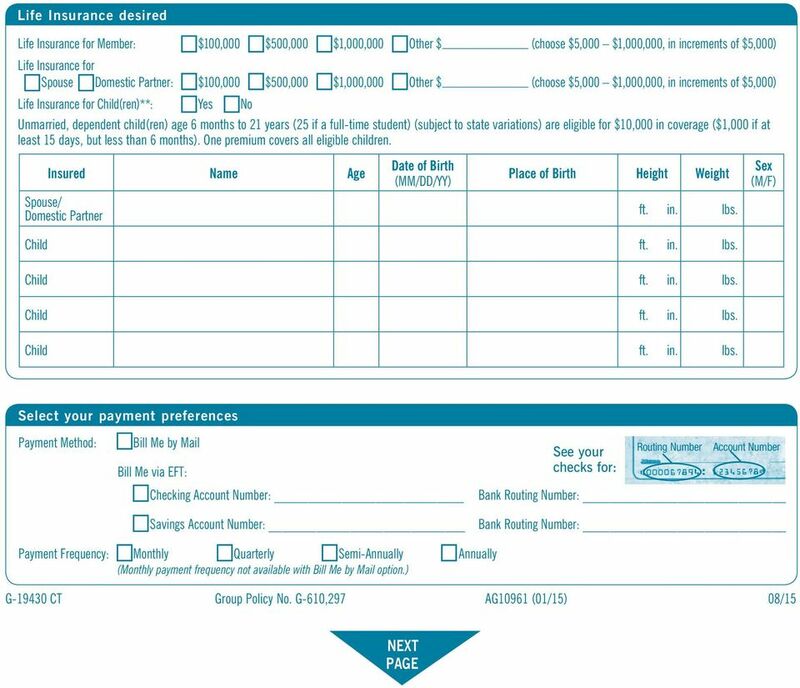 Application for Conversion of Group Term Life Insurance Aetna Life Insurance Company Application and payment of the first premium must be made within the time limit shown in your certificate or policy.